We Indians are an expressive lot, and needless to say, dance is an expression of feelings that simmer in the soul. India has a list of classical dance forms that are well regarded across the world. I am not trained in any of them neither do I understand any of them – and I am not too proud of it. Three decades too late in life, but it is never too late to spend a few hours to make an attempt to understand and appreciate a dance form that has been practised in the country since the 17th century. The first Indian classical dance performance that I was lucky to be a spectator to was Kathakali. Sitting through the one hour performance made me appreciate the dancer’s control on the eye and facial muscle. It takes over 8-10 years for a Kathakali dancer to get trained – the years of tenacity were evident during the performance. 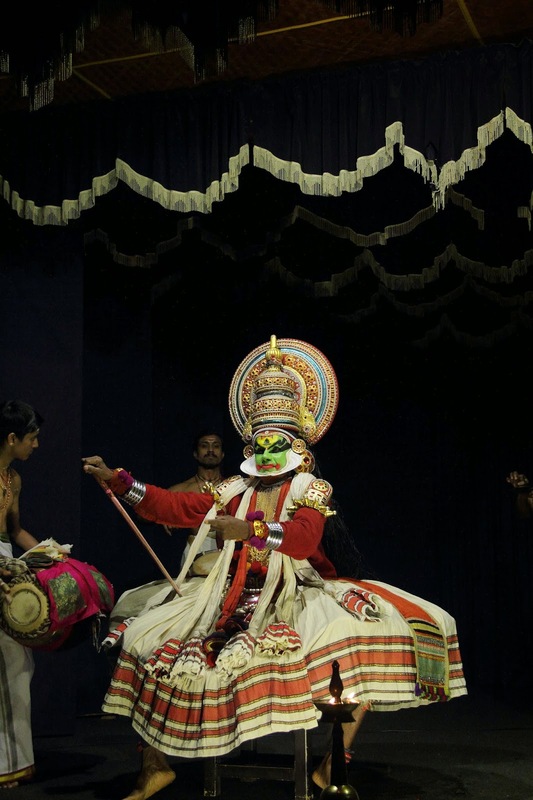 And yes… Kathakali is a man’s world! It’s a dance done only by men. Mohiniyattam, another classical dance form from Kerala is performed only by women – feminists do not be disappointed! Time to look pretty… Make up time! 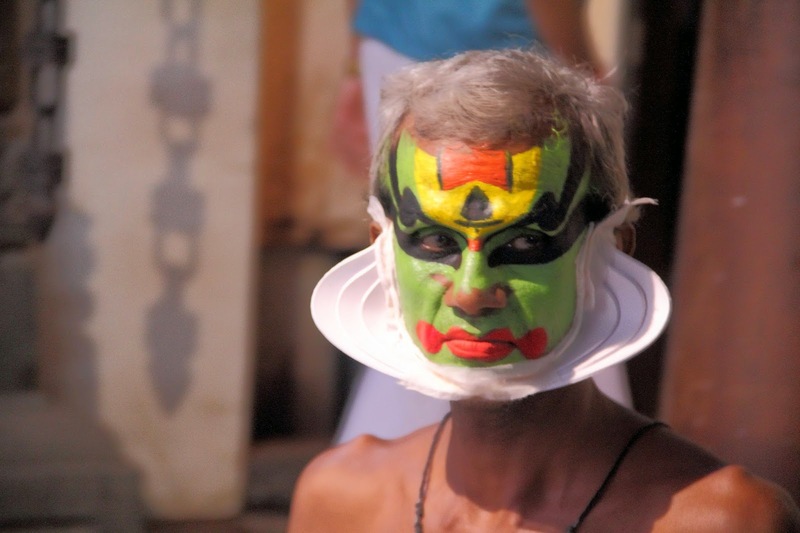 The faces of the Kathakali dancers are heavily made up. Each dancer spends over 1 to 1.5 hour on the make up process prior to the performance. 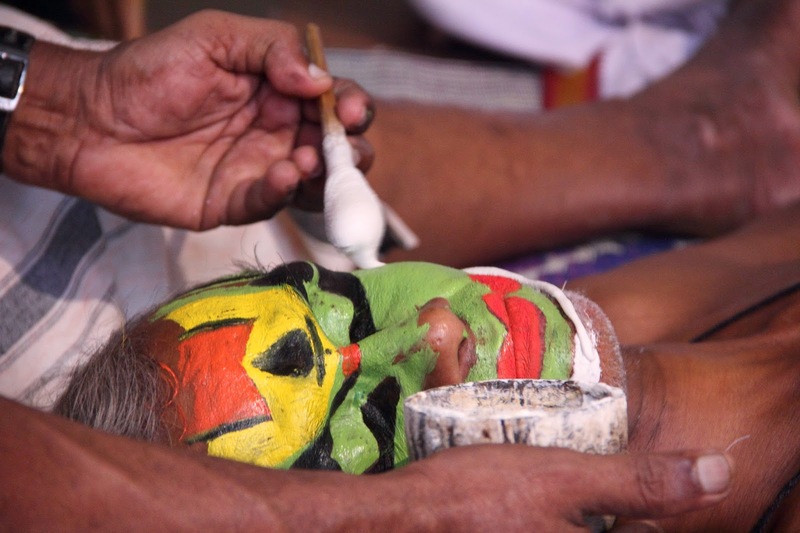 First Stage: Preparing the base and painting the face with the dominant colour using a thin bamboo stick.The colours are special face colours, which are diluted using rice paste. Second Stage: Construction of the face mask with ordinary paper, cloth and loads of rice paste. Not all dancers have this component. Final Stage: Final touches. Some artistic drawing on the face or blending in the mask with the base colours. The entire make up process requires a lot of patience by the artist – he cannot talk or move his facial muscles until all is set. Hats off to the performers and the make up artists! 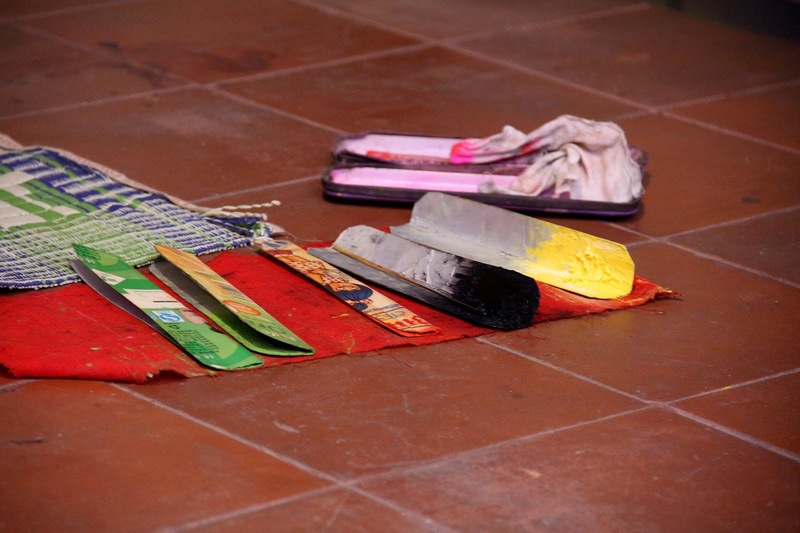 The prime colours on the artists’ face are related to the character that they portray during the performance. Ever wondered why are the performers’ eyes red? 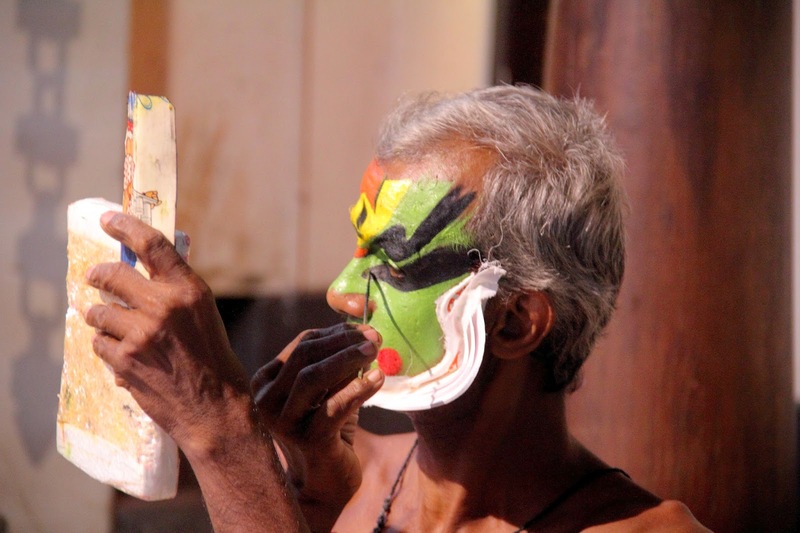 Kathakali performers have outstanding control on their facial and eye muscles – they can move them in sync with the drum beats – that says it all! The dancers convey the story using hand movements called mudras. There are a total of 24 basic mudras which can be used by the dancer. There are ‘Asamyutha Mudras’ (that is shown using single hand) and ‘Samyutha Mudras’ (mudras shown in double hands) in each Basic Mudras, to show different symbols. Considering all these Mudras and their separations there are totally 470 symbols used in Kathakali. Kerala: Kathakali dancer in action! The dance form is performed using the bass from the percussion instruments. Typically, a vocalist gives the background to the performance using Carnatic music. 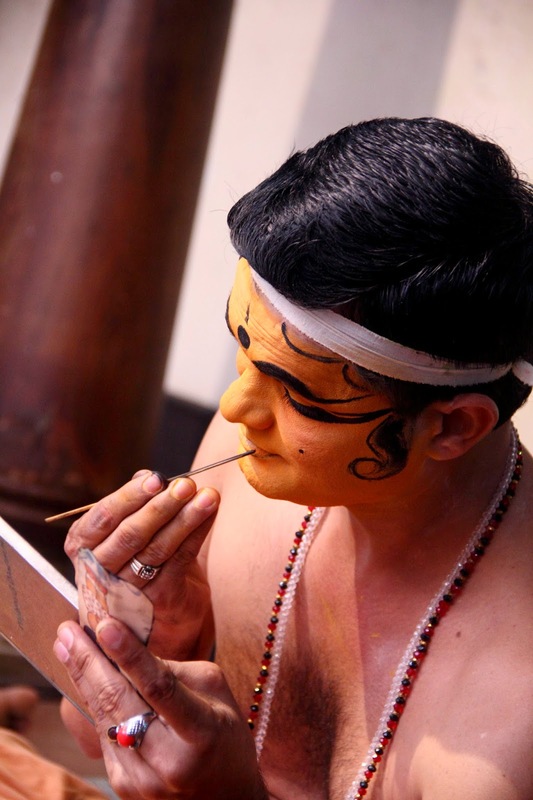 Enjoy the performance anywhere in Kerala: Kathakali performances are tourist attractions. Most tourist town in Kerala will have one or two centres. We saw a performance in Fort Kochi at the Greenix village. The ticket price for the one hour Kathakali performance was approximately USD 4 (including entrance to a small museum and one hour to watch the make-up session). Make up time: The make up starts typically one hour prior to the performance time. I would recommend witnessing at least the last 30 minutes of the make up time – will increase your appreciation for the dance form. So much to share: The staff at the centres are fairly knowledgeable about the dance and are glad to share their knowledge. Ask questions – you need to have some basics in place to understand the story being enacted during the performance. It is best to have a snapshot of the story that will be enacted on the stage during the performance. Two hours with the Kathakali artists have let me peep into the world of Indian classical dance and have added a few must see concerts to my bucketlist. Yep…not a dance that kids would enjoy!